This article is about the sound in spoken language. For the letter, see Glottal stop (letter). For consonants followed by superscript ˀ, see Glottalization. The glottal stop or glottal plosive is a type of consonantal sound used in many spoken languages, produced by obstructing airflow in the vocal tract or, more precisely, the glottis. The symbol in the International Phonetic Alphabet that represents this sound is ⟨ʔ⟩. As a result of the obstruction of the airflow in the glottis, the glottal vibration either stops or becomes irregular with a low rate and sudden drop in intensity. Its phonation is voiceless, which means it is produced without vibration of the vocal cords; necessarily so, because the vocal cords are held tightly together, preventing vibration. 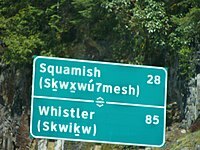 Road sign in British Columbia showing the use of 7 to represent /ʔ/ in Squamish. In the traditional Romanization of many languages, such as Arabic, the glottal stop is transcribed with an apostrophe, ⟨’⟩, which is the source of the IPA character ⟨ʔ⟩. In many Polynesian languages that use the Latin alphabet, however, the glottal stop is written with a reversed apostrophe, ⟨ʻ⟩ (called ‘okina in Hawaiian and Samoan), which is used to transcribe the Arabic ayin as well and is the source of the IPA character for the voiced pharyngeal fricative ⟨ʕ⟩. In Malay the glottal stop is represented by the letter ⟨k⟩, in Võro and Maltese by ⟨q⟩. Other scripts also have letters used for representing the glottal stop, such as the Hebrew letter aleph ⟨א⟩ and the Cyrillic letter palochka ⟨Ӏ⟩, used in several Caucasian languages. Modern Latin alphabets for various Indigenous Languages of the Caucasus use the letter heng ('Ꜧ ꜧ'). In Tundra Nenets, it is represented by the letters apostrophe ⟨ʼ⟩ and double apostrophe ⟨ˮ⟩. In Japanese, glottal stops occur at the end of interjections of surprise or anger and are represented by the character ⟨っ⟩. In the graphic representation of most Philippine languages, the glottal stop has no consistent symbolization. In most cases, however, a word that begins with a vowel-letter (Tagalog aso, "dog") is always pronounced with an unrepresented glottal stop before that vowel (as in Modern German and Hausa). Some orthographies use a hyphen instead of the reverse apostrophe if the glottal stop occurs in the middle of the word (Tagalog pag-ibig, "love"; or Visayan gabi-i, "night"). If it occurs in the end of a Tagalog word, the last vowel is written with a circumflex accent (known as the pakupyâ) if both a stress and a glottal stop occur in the final vowel (basâ, "wet") or a grave accent (known as the paiwà) if the glottal stop occurs at the final vowel, but the stress occurs at the penultimate syllable (batà, "child"). Some Canadian indigenous languages have adopted the phonetic symbol ʔ itself as part of their orthographies. In some of them, it occurs as a pair of uppercase and lowercase characters, Ɂ and ɂ. The numeral 7 is sometimes substituted for ʔ and is preferred in some languages such as Squamish. In 2015, two women in the Northwest Territories challenged the territorial government over its refusal to permit them to use the ʔ character in their daughters' names: Sahaiʔa, a Chipewyan name, and Sakaeʔah, a Slavey name (the two names are actually cognates). The territory argued that territorial and federal identity documents were unable to accommodate the character. The women registered the names with hyphens instead of the ʔ, while continuing to challenge the policy. Use of the glottal stop is a distinct characteristic of the Southern Mainland Argyll dialects of Scottish Gaelic. In such a dialect, the standard Gaelic phrase Tha Gàidhlig agam ("I speak Gaelic"), would be rendered Tha Gàidhlig a'am. In English, the glottal stop occurs as an open juncture (for example, between the vowel sounds in uh-oh!,) and allophonically in T-glottalization. In British English, the glottal stop is most familiar in the Cockney pronunciation of "butter" as "bu'er". Additionally, there is the glottal stop as a null onset for English, in other words, it is the non-phonemic glottal stop occurring before isolated or initial vowels (for example, representing uh-oh!, [ˈʌʔoʊ] and [ˈʔʌʔoʊ] are phonemically identical to /ˈʌ.oʊ/). Although this segment is not a phoneme in English, it occurs phonetically in nearly all dialects of English, as an allophone of /t/ in the syllable coda. Speakers of Cockney, Scottish English and several other British dialects also pronounce an intervocalic /t/ between vowels as in city. In Received Pronunciation, a glottal stop is inserted before a tautosyllabic voiceless stop: sto’p, tha’t, kno’ck, wa’tch, also lea’p, soa’k, hel’p, pin’ch. In many languages that do not allow a sequence of vowels, such as Persian, the glottal stop may be used to break up such a hiatus. There are intricate interactions between falling tone and the glottal stop in the histories of such languages as Danish (see stød), Chinese and Thai. In many languages, the unstressed intervocalic allophone of the glottal stop is a creaky-voiced glottal approximant. It is known to be contrastive in only one language, Gimi, in which it is the voiced equivalent of the stop. The table below demonstrates how widely the sound of glottal stop is found among the world's spoken languages. It is not intended to be a complete list. Any of these languages may have varieties not represented in the table. Abkhaz аи [ʔaj] 'no' See Abkhaz phonology. Arabic Modern Standard أغاني‎ [ʔaˈɣaːniː] 'songs' See Arabic phonology, Hamza. Levantine and Egyptian شقة‎ [ˈʃæʔʔæ] 'apartment' Levantine and Egyptian dialects. Corresponds to /q/ or /g/ in other dialects. Fasi and Tlemcenian قال‎ [ˈʔaːl] 'he said' Fasi and Tlemcenian dialects. Corresponds to /q/ or /g/ in other dialects. Bulgarian ъ-ъ [ˈɤʔɤ] 'nope' See Bulgarian phonology. Chinese Cantonese 愛/oi3 [ʔɔːi˧] 'love' See Cantonese phonology. Czech používat [poʔuʒiːvat] 'to use' See Czech phonology. Danish hånd [ˈhʌ̹nʔ] 'hand' One of the possible realizations of stød. Depending on the dialect and style of speech, it can be instead realized as laryngealisation of the preceding sound. See Danish phonology. Dutch beamen [bəʔˈaːmə(n)] 'to confirm' See Dutch phonology. Australian cat [kʰæʔ(t)] 'cat' Allophone of /t/. See glottalization and English phonology. Esperanto scii [ˈst͡si.ʔi] 'to know' See Esperanto phonology. Finnish sadeaamu [ˈsɑdeʔˌɑ:mu] 'rainy morning' See Finnish phonology. German Northern Beamter [bəˈʔamtɐ] 'civil servant' See Standard German phonology. Guaraní avañe’ẽ [ãʋ̃ãɲẽˈʔẽ] 'Guaraní' Occurs only between vowels. Hawaiian ʻeleʻele [ˈʔɛlɛˈʔɛlɛ] 'black' See Hawaiian phonology. Hebrew מַאֲמָר‎ [maʔămar] 'article' Often elided in casual speech. See Modern Hebrew phonology. Icelandic en [ʔɛn] 'but' Only used according to emphasis, never occurring in minimal pairs. Iloko nalab-ay [nalabˈʔaj] 'bland tasting' Hyphen when occurring within the word. Indonesian bakso [ˌbäʔˈso] 'meatball' Allophone of /k/ or /ɡ/ in the syllable coda. Javanese anak [änäʔ] 'child' Allophone of /k/ in morpheme-final position. Korean 일 [ʔil] 'one' In free variation with no glottal stop. Occurs only in initial position of a word. Malay tidak [ˈtidäʔ] 'no' Allophone of final /k/ in the syllable coda, pronounced before consonants or at end of word. Minangkabau wa’ang [wäʔäŋ] 'you' Sometimes written without an apostrophe. Nahuatl tahtli [taʔtɬi] 'father' Often left unwritten. Nheengatu ai [aˈʔi] 'sloth' Transcription (or absence thereof) varies. Persian معنی‎ [maʔni] 'meaning' See Persian phonology. Portuguese Vernacular Brazilian ê-ê [ˌʔe̞ˈʔeː] 'yeah right' Marginal sound. Does not occur after or before a consonant. In Brazilian casual speech, there is at least one [ʔ]–vowel length–pitch accent minimal pair (triply unusual, the ideophones short ih vs. long ih). See Portuguese phonology. Sardinian Some dialects of Barbagia unu pacu [ˈuːnu paʔu] 'a little' Intervocalic allophone of /n, k, l/. Spanish Nicaraguan más alto [ˈma ˈʔal̻t̻o̞] 'higher' Marginal sound or allophone of /s/ between vowels in different words. Does not occur after or before a consonant. See Spanish phonology. Tagalog oo [oʔo] 'yes' See Tagalog phonology. Vietnamese oi [ʔɔj˧] 'sultry' In free variation with no glottal stop. See Vietnamese phonology. Võro piniq [ˈpinʲiʔ] 'dogs' "q" is Võro plural marker (maa, kala, "land", "fish"; maaq, kalaq, "lands", "fishes"). ^ a b Umeda N., "Occurrence of glottal stops in fluent speech", J. Acoust. Soc. Am., vol. 64, no. 1, 1978, pp. 88-94. ^ Paul Morrow (March 16, 2011). "The basics of Filipino pronunciation: Part 2 of 3 • accent marks". Pilipino Express. Retrieved July 18, 2012. ^ Ricardo M.D. Nolasco. Grammar notes on the national language (PDF). ^ Joan Schoellner & Beverly D. Heinle, ed. (2007). Tagalog Reading Booklet (PDF). Simon & Schister's Pimsleur. pp. 5–6. ^ "Proposal to add LATIN SMALL LETTER GLOTTAL STOP to the UCS" (PDF). 2005-08-10. Retrieved 2011-10-26. ^ Browne, Rachel (12 March 2015). "What's in a name? A Chipewyan's battle over her native tongue". Maclean's. Retrieved 5 April 2015. ^ Brown, Gillian. 1977:27. Listening to spoken English. London: Longman. ^ Kortlandt, Frederik (1993). "General Linguistics & Indo-European Reconstruction" (PDF). ^ Collinder, Björn (1941). Lärobok i finska språket för krigsmakten. Ivar Häggström. p. 7. ^ Yager, Joanne; Burtenhult, Niclas (December 2017). "Jedek: A newly-discovered Aslian variety of Malaysia" (PDF). Linguistic Typology. 21. doi:10.1515/lingty-2017-0012 – via deGruyter. ^ Phonetic symbols for Portuguese phonetic transcription In European Portuguese, the "é é" interjection usually employs an epenthetic /i/, being pronounced [e̞ˈje̞] instead. Wikimedia Commons has media related to Glottal stop.